Now you can own.a fine Camera .outfit! on Sears Easy Terms with no carrying charge. and simple; your subject is always in focus. Uses either film packs or cut film. for all-around photography and is the same type as used by the Military Forces. Contains the following: one 4x5-inch Speed Graphic, equipped with 127mm. camera. 3U-in. wide angle Optar lens; solenoid fitted to above lens for flash. The new style carr)'·all case is made of sturdy fiber and reinforced with metal. 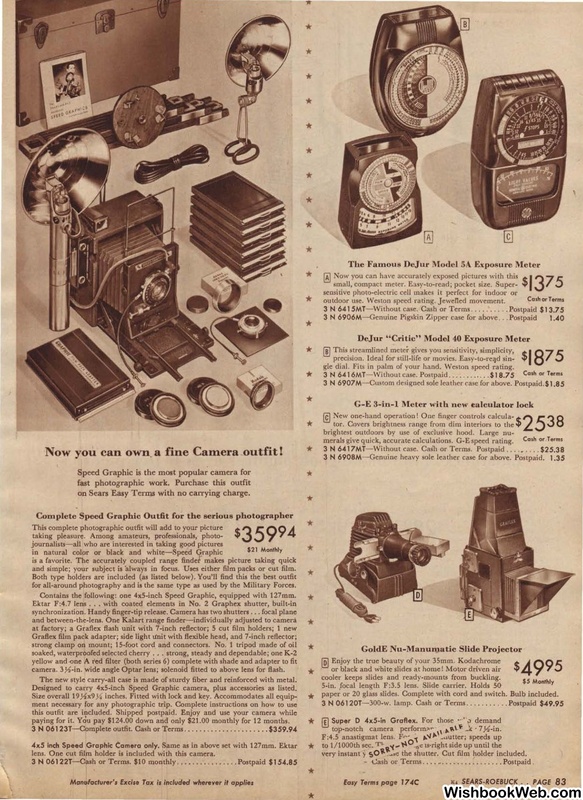 Designed to carry 4x5-inch Speell Graphic camera, p\us accessories as listed. paying for it. You pay $124.00 down and only $21.00 monthly for 12 months. lens. One cut film holder is included with this camera. outdoor use. Weston speed rating. Jewened movement. gle dial. Fits in palm of your hand. Weston speed rating. merals give quick, accurate calculations. G-E speed rating. cooler keeps slides and ready-mounts from buckling. paper or 20 glass slides. Complete with cord and switch. Bulb included. the shutter. Cut film holder included. - ·Gash or Terms . .. . • ........ .. ...... Postpaid .